After a long wait, the new Bucks arena finally has a name: the Fiserv Forum. Published July 26, 2018 at 1:32 p.m. 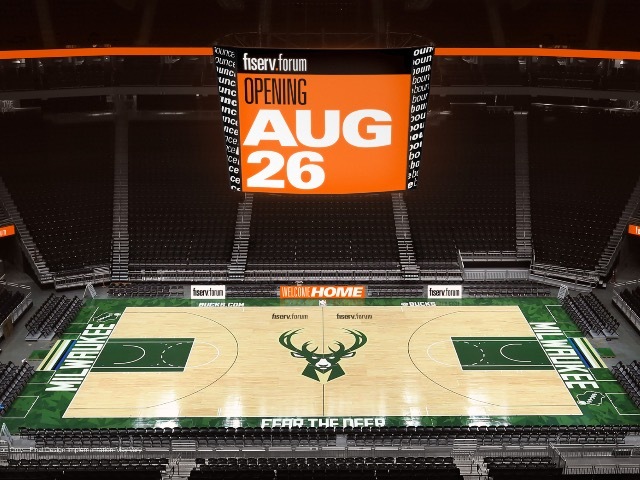 The new Milwaukee Bucks arena finally has a name, and it is the Fiserv Forum. The Bucks and Fiserv, the global financial services technology firm based in Brookfield, announced on Thursday that they had signed an exclusive naming rights agreement for the nearly completed Wisconsin Entertainment and Sports Center. The deal is for 25 years and financial terms were not disclosed. Fiserv was rumored to be the sponsorship frontrunner for the past few months, and the news officially answers the question that's been on Milwaukee's mind since the beginning of the year, when the team was expected to secure a partner. According to the release, the Fiserv brand will be prominently featured on the building's exterior façade, playing surface and rooftop, as well as throughout the facility, which "is the centerpiece of a 30-acre business, residential, cultural and entertainment revitalization in the heart of Downtown Milwaukee." The new venue, which is nearly finished and officially opens to the public on Sunday, Aug. 26, will be home to the Bucks and the Marquette Golden Eagles men's basketball team. It will also showcase world-class entertainment acts and other events, many of which have already been revealed. 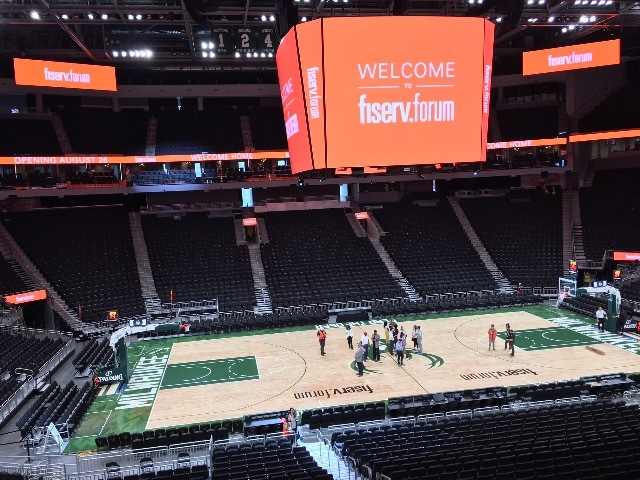 During a hastily scheduled announcement Thursday afternoon, Bucks President Peter Feigin and Fiserv President and CEO Jeff Yabuki introduced the Fiserv Forum. The Killers will headline the grand opening concert on Tuesday, Sept. 4, and the arena will host more than 200 events annually, including Justin Timberlake, Pink, Elton John, Fleetwood Mac and the Foo Fighters in its inaugural year. "We are excited to partner with the Milwaukee Bucks to create an unprecedented opportunity to elevate our brand as one of the world's leading providers of financial technology and payment services," Yabuki said. "We also expect this arrangement to further differentiate our brand in support of our purpose of delivering value and excellence to our clients every day." The name "Fiserv Forum," the two sides say, is a nod to Fiserv's annual client experience event where the world's best and brightest technology, financial services and business professionals gather to exchange ideas. 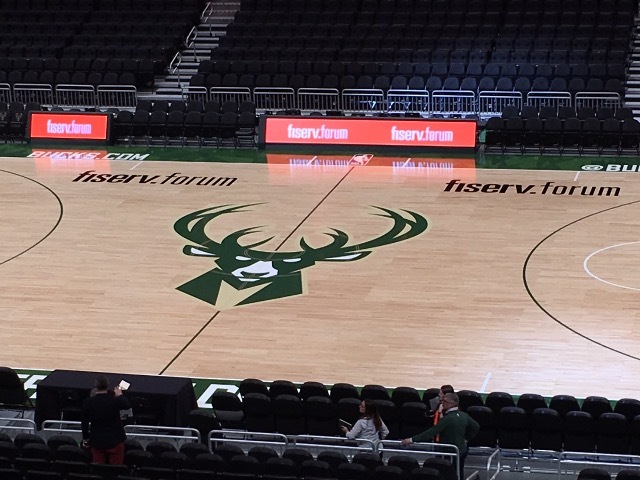 "We are proud to become a long-term partner with Fiserv, a dynamic international company with a prominent Wisconsin presence, which deeply shares our commitment to bettering and growing Milwaukee," Bucks owners Wes Edens, Marc Lasry and Jamie Dinan said in a statement. "It was clear from the start of our conversations that the Bucks and Fiserv align perfectly in our goals for innovation and leadership, and carry the same passion for excellence. "As Fiserv Forum becomes an internationally recognized venue, we are excited to be an instrumental part of furthering Fiserv's brand as a leader in its industry. Fiserv Forum will be the entertainment and sporting heart of our city and will deliver memorable experiences for fans and families in Wisconsin for generations to come." The visual identity for Fiserv Forum, the Bucks said, incorporates a period – or "proof point" – between the two lower-case words, symbolizing a connection point and "embodying the full-hearted Fiserv commitment to excellence." The period connects the brand promise, to be a Partner in Possibility, to the community, as well as connecting the financial technology leader to the future, to a newly broadened audience and to the "vibrancy and energy" that Fiserv Forum will hold at events and with fans. Yabuki said the agreement further affirms Fiserv's local commitment. "It's an honor and privilege to continue the tradition established by Jane Bradley Pettit, whose generosity and love for the Milwaukee community funded the city's prior arena more than 30 years ago," he said. "We are proud to be a part of the transformation and revitalization of our home community that continues to evolve for the better."